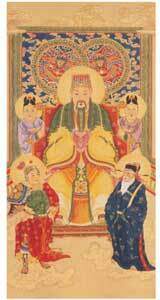 Based on one account the Jade Emperor was originally the crown prince of the kingdom of Majestic Heavenly Lights and Ornaments. At birth he emitted a bright light that filled the entire kingdom. When he was young, he was benevolent, intelligent and wise. He devoted his entire childhood to helping the needy (the poor and suffering, the deserted and single, the hungry and disabled). Furthermore, he showed respect and benevolence to both men and creatures. After his father died, he ascended the throne. He made sure that everyone in his kingdom found peace and contentment, after that he told his ministers that he wished to cultivate Dao in a mountain cave and cultivate. After 1,750 trials, each trial lasting for 120,976 years, he attained Immortality. After another a hundred million years of cultivation, he finally became the Jade Emperor. His birthday is celebrated on the ninth day of the Lunar New Year commonly known as “Tian Gong Dan” (天 公 �Q Festival of the Heavenly God). It is an important festival to the Taoists and Chinese community. Taoist temples throughout the world held gathering and prayers together to worship him. To beseech him to grant peace, prosperity, protection from calamities for the entire year, favorable weather conditions, and abundant harvest. Most people are not aware that the Jade Emperor is the protector of the Buddha dharma in Buddhism. He’s called Lord Sakra or Indra or in the Shurangama Mantra (楞 �� 咒) his name is recited as “Namo Yin Two La Ye” (南 �o 因 陀 �_ 耶).